I remember eating instant oatmeal almost every morning growing up. My favorite flavor was maple brown sugar. If the dark brown packages were gone, I’d choose cinnamon and spice next. It was a special occasion if we had any of the fruit and cream ones (I’d choose blueberry). I’d gently rip open a package (after learning the hard way what happens if you tear too fast), pour it into my favorite bowl and cook it myself in the microwave. I’d sit on one side of a massive, round, farmhouse-style table in the kitchen and watch “The Bozo Show” on a small, black and white TV sitting on a bench on the other side of the table. I felt like such a big kid being awake before everyone else, making my breakfast all by myself. Like my mom trusted me (and my cooking skills) enough not to set the house on fire. My heart certainly isn’t ready for my kids to grow up (will it ever? ), but I know it’s in their best interest to teach them how to be a more independent. The first day of school is next week, and I figure there’s no better time nor no better starting place than homemade instant oatmeal for breakfast. Of course they’ll learn a bit of independence from packing their own school lunches, but that’s different. I’ll still be there, preparing some of the options, helping them make right choices and showing them how to make everything fit in their lunchbox. But opening a packet of oatmeal, pouring it into a bowl, adding water and cooking it all by themselves… well, that’s different. I know what that feels like, and I’m ready for them to experience this like I did each morning before getting ready for school. Nostalgia aside, I think this might help our mornings go a bit smoother too. I didn’t know it at the time, but store-bought instant oatmeal contained quite a bit of sugar… at least much more than what was needed in each 3 tablespoon serving. It’s no wonder that maple and BROWN SUGAR was my favorite flavor and that the plain packets would sit untouched in the boxes for weeks. Now, I’m not condoning sweetener in oatmeal. Oh no no no… in fact, adding a teaspoon (or two) of brown sugar was the ONLY way I could get the kids to eat oatmeal for breakfast for a REALLY long time. 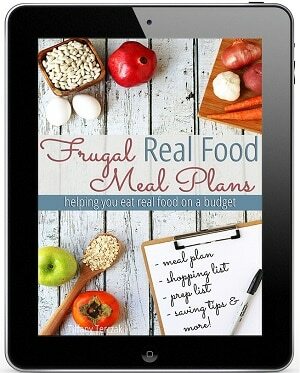 It was a small concession I had to make when we first started transitioning to real food. Gradually though, the amount of brown sugar in each bowl became less and less. Now (3+ years later) the kids don’t add any sweetener at all (I still add maple syrup to mine though – old habits die hard). My point though is that I like to be able to control the type of sweetener in the oatmeal and how much we add. This is MUCH easier to do when we make homemade instant oatmeal ourselves rather than trying to do some crazy math conversion of grams per serving into teaspoons so we can tangibly understand how much sugar is in each little packet… all before we’ve had a full cup of coffee, no less. Plus making our own homemade instant oatmeal packets means making whatever flavors we want, never running out of our favorite flavor, avoiding unnecessary additives and saving money. Truly a win all around! I like to use rolled oats because they’re less processed than instant oats and more affordable than steel cut. I did a write up on the difference between the types of oatmeal here, if you want to read more. Tip: Want your oatmeal to taste more like the commercial kind? Add 1 tablespoon oat flour per 1/2 cup of oats! 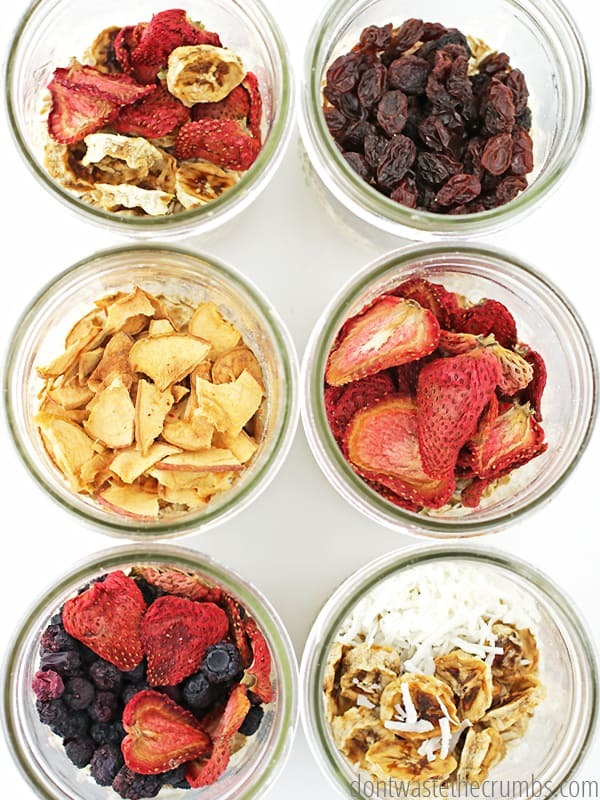 A good rule of thumb is to use a ratio of 1:2 for dried fruit to oats. For example, my kids are eating 1/4 dried fruit with 1/2 cup of oats for breakfast. The dried fruit measurement should be total, so reduce as necessary (or not!) if you’re mixing/matching flavor combinations. 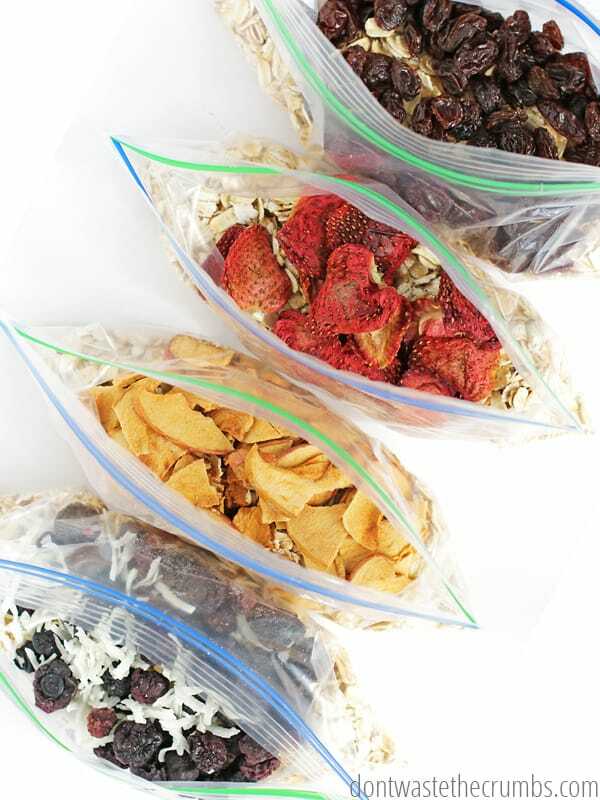 I use dehydrated fruit in this recipe because the point is to make several bags ahead of time. If your kids don’t mind adding fresh fruit to oats (and you’re comfortable with them potentially needing a knife without you supervising), feel free to use whatever fresh fruit you have on hand. For weekdays and fostering independence at my kids’ young age, I personally prefer the dried fruit route. 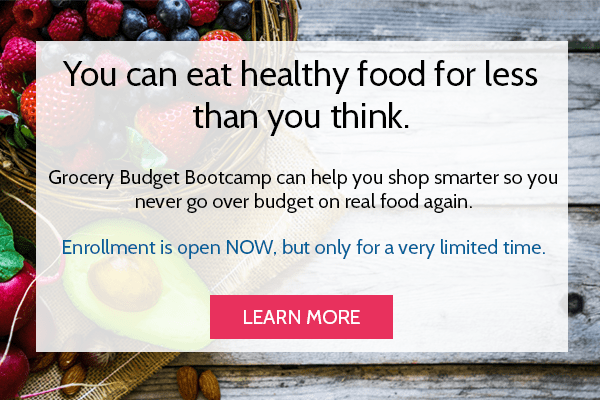 You can also use freeze dried fruit, although it’s pricier. Homemade dehydrated fruit is by far the most frugal option. Adding powdered milk to the individual packets is easier for the kids. They continue to choose a packet and make it the same, every time. Simply choose whichever is best for you in this season. 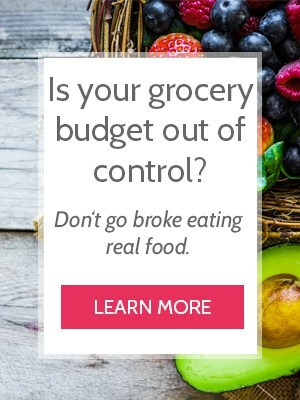 Either option is better than store-bought! If you add nuts, add them after cooking otherwise they loose their crunch and don’t taste nearly as good. We only add nuts on purpose when making the Amish flavor (my favorite right now, recipe below), otherwise we wait until there’s only crumbs left in the packages of nuts and then add those to the packages. You can increase the nutritional value of oatmeal by adding 1 tablespoon of chia seed, flax seed, oat bran, hemp hearts, sunflower seeds or any other seed you have. Chia seeds will absorb quite a bit of moisture as they cook and sit, so you might need to add more liquid up front. Flax seed and oat bran will absorb a little, hemp hearts and sunflower seeds won’t absorb any at all. I mentioned earlier that you should not feel guilty for adding sweetener if it means oatmeal for breakfast. I’ve found that one teaspoon of brown sugar OR 1 tablespoon of maple syrup tends to be sufficient when you’re combining it with the naturally sweet dried fruit. Although healthier, I purposely don’t use coconut sugar, palm sugar or any other less processed granulated sugar in oatmeal. I’ve found that these sweeteners aren’t as sweet, which means having to use more to please the taste buds. Personally, I’d rather use less sugar than more, even if it means using a less healthier option during the transition. 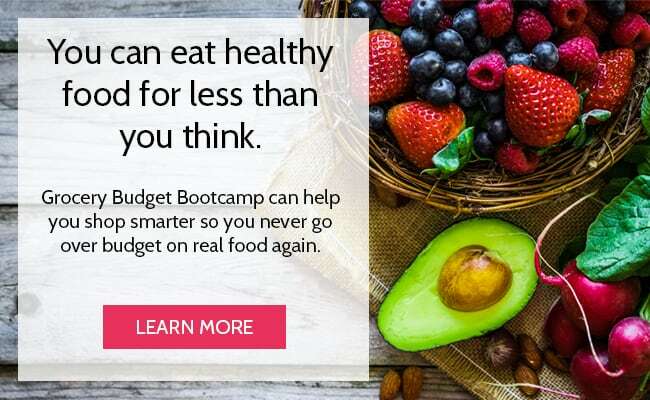 Plus the “healthy” sugars cost twice as much, a fact you can’t overlook when you’re trying making one of the most frugal breakfasts known to man. Whichever you decide, add dry sugar to the dry packets or maple syrup (or honey, if you prefer) just after cooking. Like adding cream, choose whichever fits the cooking capabilities of your kids right now. A little bit of spice goes a long way in a small package of oatmeal, so start with 1/4 teaspoon and add more from there. Cinnamon is the most popular spice, but you can add pumpkin, apple pie spice or mix/match cinnamon, nutmeg, clove and all-spice from the cabinet. Salt is also an option, although personally we don’t add any. A pinch per packet will enhance the flavor, but anymore will simply make it salty. Use cautiously and remember that you can always add more if you want. This is totally optional, but one tablespoon of butter or coconut oil is a tasty option. My daughter likes butter in her oatmeal, but my son doesn’t. Obviously this is something you can’t add to dry packets, so your kids should be old enough to be able to measure butter or coconut oil on their own if you want this in their oatmeal (as well as get it down from the pantry or find it in the fridge). With the basics out of the way, here comes the fun part! 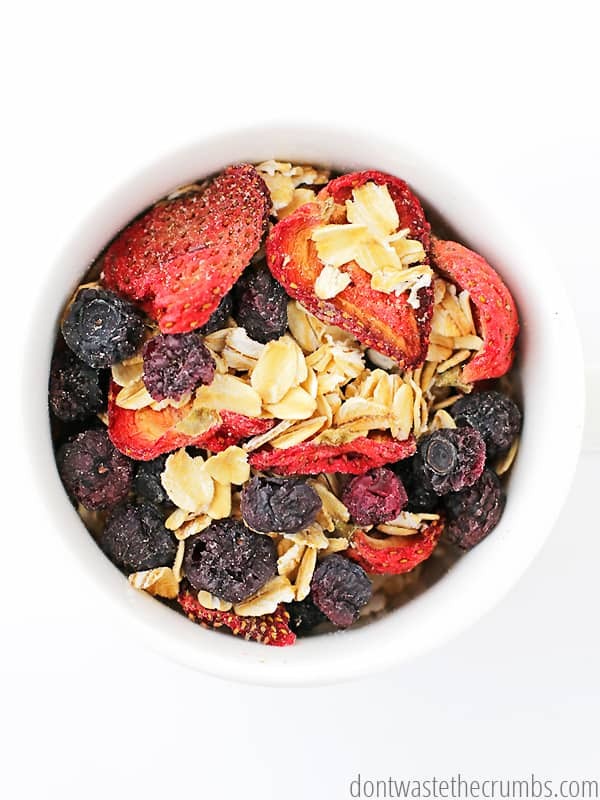 Homemade instant oatmeal comes with UNLIMITED flavor combinations. My kids helped me choose the flavors for these photos, and it was so neat watch their little wheels turn as they paired fruits and spices, each to suit their own unique personality. The most frugal option is to make your oatmeal based on what you already have in the house, but I’ve also together a few combinations for those parents who struggle with creativity in the kitchen. If you’re looking for fancier flavors, search the web. From cherry almond to caramel cashew, there are some seriously awesome ideas out there. In the end, add whatever you want – that’s the beauty of doing it yourself! Besides, we’re not that fancy. Sticking to basic dried fruit + spice and/or cream makes it easier to make a big batch of these up front (meaning less work for breakfast with each subsequent week!). Pull out all of your coffee mugs from cabinet and set them on the floor. Let the smaller kids measure the dried fruit and/or nuts into each mug. Tip: Give them the appropriate measuring tool and tell them how many scoops per mug. Finish off with the sweetener and/or powdered milk (if using either). Have a child hold open a baggie while you empty each mug into it. Using a funnel makes this easier. Seal the bags and store in a basket, on a shelf in the pantry that the kids can see and reach. 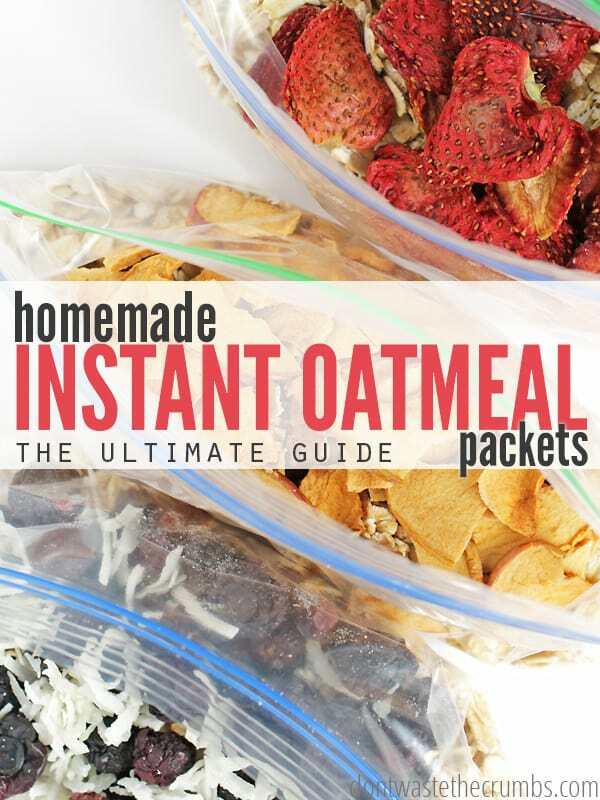 I once timed this process to see how long it took to make homemade instant oatmeal packets. In one hour, we made enough for six weeks worth of breakfast. How’s that for time well spent! Tip: Reader Cheri shared this awesome tip – instead of measuring into the mug and then pouring into the baggie, place the baggie INTO the mug – essentially lining the mug with the baggies – and then measuring the ingredients directly into the bag. When you’re done, pull it out, zip it up and your mugs are still clean. Pure genius if you ask me – thank you Cheri! You can always boil water on the stove and add it to the dry oatmeal, but I don’t let my kids cook on the stove without me so that won’t work for us. We’ve walked through this process – step by step – a few times this past week so that next week they’ll know how to do it on their own. Set out everything the kids will need for breakfast the night before: bowls, spoons, measuring cups and basket of oatmeal. Plug in the microwave if you know the kids will be awake before you. If your keep your water in a large jug or something that isn’t very kid-friendly, consider pouring some into a glass for them to measure from. Even better, measure the water for them into glass the night before. Then in the morning they simply empty the glass into the bowl and they’re done! If you’re not sure if your kids are ready to handle breakfast on their own, another awesome option is to make these packets but cook them individually in the slow cooker. You empty the packet and add water. They take the jar out in the morning. Shoot, we might do this option anyway since it’s so easy! 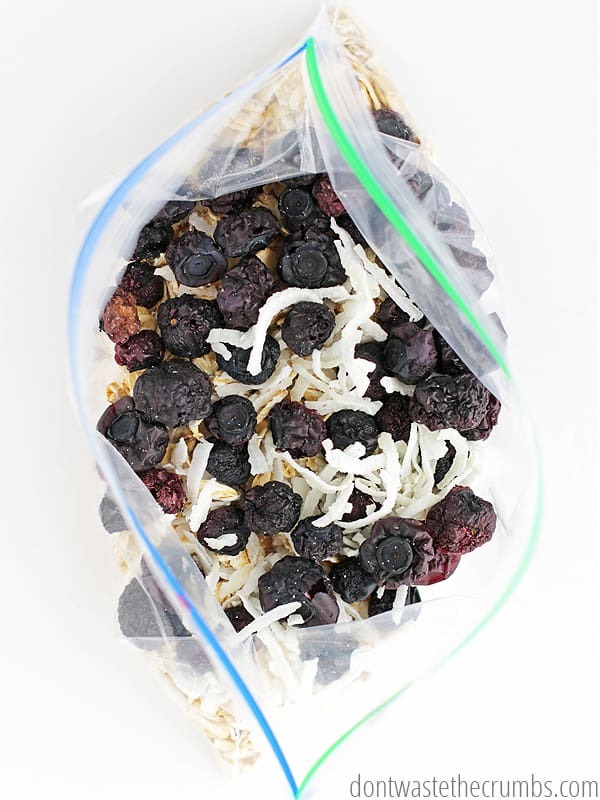 Homemade instant oatmeal packets are an easy way to fuel the kids before their day starts, and with the prep work done ahead of time, it makes mornings a bit smoother too! 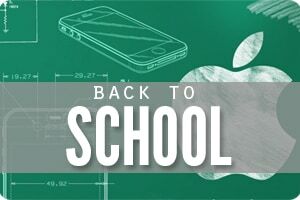 Get more frugal, affordable and awesome back to school ideas or check out “The Healthy Lunchbox” – it’s one of the best eBooks I’ve read on healthy lunches, including back to school! What was (or is!) your favorite flavor of oatmeal? Make Six Weeks Worth of Breakfast in Just One Hour! Great idea! I’m going to try this with my daughter. Thank you Kayla! I hope your kids enjoy it like mine do. It makes them feel so much more involved – plus there’s no complaints about eating it! I’m with you in the maple brown sugar!! I also lived the peaches and cream;). I think this is a great idea and will add it to the mid week list of breakfasts in our house. Ooh, peaches and cream! Loved that one too!! HI. You can save a step on the preparation with this tip. Put a plastic baggie in each coffee mug; open it and fold the top back over and around the rim of the mug. This lines the mug with the baggie you are trying to fill, keeps the baggie open, and keeps the zip closure out of the way so it doesn’t get food on it before you are ready to close it. I do this when I save leftover spaghetti for a future thermos lunch for my son. I put a baggie in the thermos and fill it so I know how much will fit, then lift if out, zip it, and freeze it for a future hot lunch. When needed, I take it out of the freezer and put it in the fridge the night before, microwave it in a bowl in the morning, then load it into the thermos (knowing it’s the right amount). This is PURE genius Cheri! I’m updating the post right now – thank you so much for sharing this with us!! Ah thanks. And now my son says I’m famous 🙂 Just fyi though, you accidentally typed “instead of mixing in the bowl and pouring into the mug” when you meant to say instead of mixing in the mug and pouring into the baggie. I can’t imagine how much effort you must spend getting all your words thought out and typed coherently for a post like this. Thanks for all your information. I enjoy reading your blog and check it frequently. I’ve found I prefer flax meal to flax seeds in my oatmeal…I prefer the lack of flavor, per se, of the meal to the seeds, which don’t seem to cook properly in a microwaved bowl of oatmeal. I mix my oatmeal “packets” in microwave safe seal-able containers for preparing/eating at work. That’s a great addition Scott – thanks for sharing! This is genius. I don’t even have children and I want to do this for myself. I’m 31 and single and my work/private life is just so busy. I love breakfast, but sometimes I don’t always have the time (or desire) to cook it. I love it. Thank you so much. A word of warning. Never put hot liquids in styrofoam cups. The heat leaches styrene out of the cup and can wreak a lot of havoc in your body. Best to use paper cups if you have to use disposables. I just use my own personal mug. It only takes seconds to wash it out. 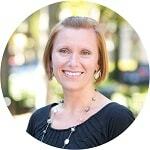 Thanks so much for your blog. 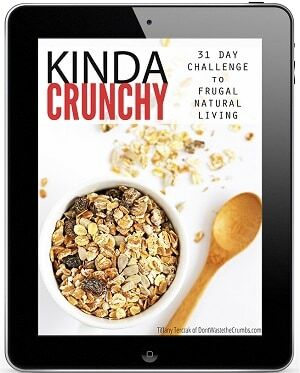 Like so many others, I really appreciate it as I try to live a more natural lifestyle on a tight budget. The key to non-mushy oatmeal is the amount of water you use, choosing rolled oats instead of instant and not cooking to obliteration, lol. We like it on the thicker, heartier side, and this recipe will give that. 60-90 seconds in the microwave plus a cool down time is spot on for us. About 3/4 cup of water for the oats/fruits works well, but honestly, I tend to eyeball it and add water JUST to the point where I see it peeking out behind the oats. Remember that you can always add more water, but you can’t take it back out! Can you reduce the cook time to prevent mushiness, yes. Yes, adding boiling water (stirring and covering and waiting 1-3 min) is sufficient. Here’s what I would do. Start with oats + 1/2 cup water, microwave 1 min. If needs more water, add 2 Tbsp, stir and microwave for 30 s. Stir and if cooked, let sit. It’ll thicken as it cools. If not cooked and dry, add 2 Tbsp water, microwave 30s more and call it done. Is the boiling water/microwave method enough to cook the rolled oats or is the texture more like hot muesli? Whenever I have seen recipes like this in the past they have always been sure to specify quick-cook oats. It’s easy to buzz rolled oats in the blender to break them down a little, but is it necessary? this would be great except the you promote cooking it in a microwave. Microwaved food has lost most of its nutrition. It changes the food on a molecular level. Microwaves are banned in parts of Europe. There is a lot of info on this if you take time to research. cheers! Thanks Christina! We haven’t gotten that far in our natural living journey yet, but I appreciate you sharing this with me! I admit my research is limited, but what I’ve found is that microwaving is actually one of the better cooking methods to retain nutrients. Regardless of the method, heat destroys nutrients, but reducing the heat exposure with a quick cooking method retains more nutrients. It is important not to use too much water (like when boiling vegetables) since that destroys a lot of nutrients. This was an issue in some studies that supported the nutrient killer theory (i.e., food was microwaved with too much water, so that may have caused the nutrient loss). I haven’t spent hours researching this, so maybe there’s strong evidence I haven’t found that shows microwaves really should be avoided. I do prefer more traditional methods when I have time because the results are usually better, but if I’m in a hurry, the evidence I’ve found makes me comfortable with the microwave. If you ever research this, I’ll be very interested in your conclusions! Gotta agree with ChristinA on this one. I’ve scoured the web for information on the possible dangers of microwave cooking and I am still not convinced either way. But my wife and I ditched our microwave oven about a decade ago and never regretted it. The old adage “better safe than sorry” might apply here? In regards to cooking oatmeal… how hard is it to boil water in the traditional manner? Don’t want to run the risk of kids scalding themselves on the stovetop? I daresay that scalding is still possible with oatmeal heated in a microwave. That said, I appreciate the ideas presented here and will give homemade instant oatmeal a try! Thanks Tiffany! I love that you list the different amounts of oats that work best for the different ages of your kids, but I didn’t understand what the corresponding water measurement is for each of those varying oat levels. Can you clarify for me. I see what you mean Brittney. My general rule of thumb is 1:1.5 for oats to water ratio. So if you’re making 1/2 cup oatmeal, use 3/4 cup water. But then again, my kids like THICK oatmeal. I suggest starting there, because you an always add more water, but you can’t take it back out! Do you have the amounts to use if you just want to make a big batch of the flavored oatmeal and then take a measured amount out at a time? That would be better for my husband and I. How big of a batch depends on you Michele, but for adults I’d measure 1/2 cup oatmeal + 1/2 tsp flavor, per person. So if you wanted to make 5 days worth for 2 people, it would be 5 cups of oats + 5 tsp of flavors. You can also add more/less flavor, to your own preference! We have a 4 cup coffee maker that we use to make hot water for tea, hot cocoa and/or certain soups.